This piece is an exploration of the journey the human mind takes throughout it's lifetime. The mind is impossibly capable of growth, adaptation and expansive thoughts but these components heavily rely on stimulus and inspiration. This inspiration can come from many places but one of the one of the oldest and purest is the nature that surrounds us. Mountains in particular can be extremely humbling and inspiring simultaneously and this tension brings the human mind to a state of balance that can lead to growth and self knowledge. This commissioned painting was made to resemble my digital pieces "White Forest" and "Underwater Trees." This gestural abstract style was developed by drawing inspiration from trees, plants, foliage and many other things found in nature. The composition of this painting grew from a singular spot and layers influenced other layers. This piece is derived from an incredibly inspiring landscape I photographed near Almont CO. I wanted to capture the unique movement found in the rolling hills, distant mountains and human made paths. I want the elevated feeling in this piece to suggest themes of hope, progress and self reflection. Acceptance of the self is the first step towards progress. This piece is a continuation in style and concept of both "Rain Squall" and "Infinite." The scene was inspired by the Great Sand Dunes in southern Colorado but the stylization was inspired by the movement of water. This piece explores themes of detachment from reality, movement and interconnectedness. 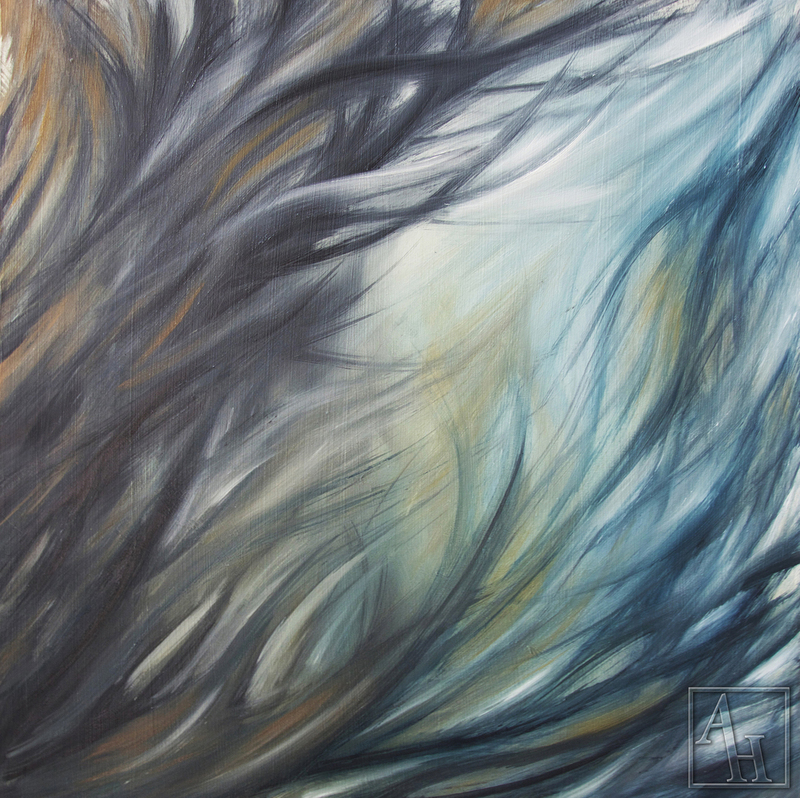 This piece brings to light themes of expansion, distance, movement and freedom. This piece asks its viewer to abandon preconceptions, bias and ego in order to experience their own emotions and ideas. This piece was a focus on process. By diluting the paint and letting it pool and flow by its own will, it created its own composition. I simply added to this by darkening, adding textures and adding more paint. This piece deals with the human emotion of change and growth. Many things catalyze human transitions and it is up to us to filter through them and decide what works for us. This piece was significant step in my abstract technique because it stuck a balance between simple and complex. The ambiguity of the environment allows for viewer imagination and appreciation of simplicity. This was inspired by the growth and movement of trees and roots. The balance of the piece lies in the contrast between the dynamic lines and textures and the atmospheric background. This painting was inspired by the movement and shapes of small plants but illustrated in a more free- form manner. The loose brushwork was used to suggest movement and shape ambiguity. This piece was an exploration of textures, negative space and composition. This piece was influenced by organic shapes such as rocks, clouds and water in order to make something that is unique and dynamic. This piece was inspired by thought of laying down in tall grass and looking up a the warm sun. The simplicity of the grass grows in abstraction and becomes more fantastical and unusual. This piece was created in the fall time when the leaves were changing and the colors of our Colorado environment were in transition. Because the composition of this piece is rather simple it allows other components such as color, texture and movement to come to the forefront. This pieces is primarily abstract except for the two predominant orange lines where were meant to be seen as figures. The figures were simplified in order to emphasize their proximity to each other and to allow them to be interpreted by the viewer.